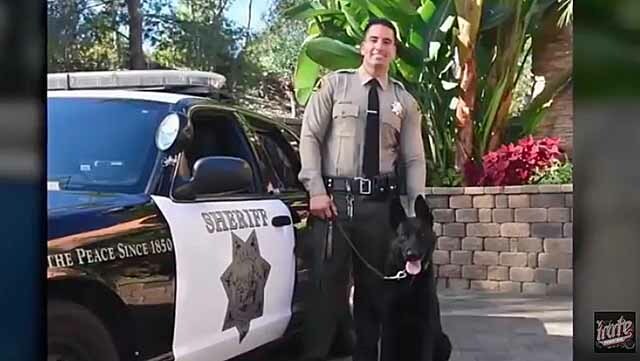 A San Diego County sheriff’s deputy charged with groping 13 women he encountered while on duty over a two-year period spoke publicly Thursday for the first time about the case against him, telling reporters the charges are false. “These charges are simply untrue. I vigorously deny them,” said Richard Fischer, who appeared in front of the San Diego Central Courthouse with his wife and his new attorney, Manny Medrano. Fischer, 32, faces 14 years and eight months in prison if convicted of assault and battery by an officer, sexual battery and false imprisonment. “It’s not just a job, it’s a calling,” Fischer said of his work as a sheriff’s deputy. Fischer said he and his wife pray every night that his good name will be cleared. Nineteen women have filed lawsuits against Fischer in civil court, alleging that he assaulted them while on patrol. The attorney said the case boiled down to a “she said, he said,” with no eyewitness, no confession from Fischer, and “significant” credibility problems with alleged victims. Medrano said his team has started its own investigation into the criminal charges against Fischer, who is scheduled to be back in court Aug. 30. Deputy District Attorney Annette Irving told Judge Daniel Goldstein at the end of a five-day preliminary hearing that Fischer “preyed” upon the alleged victims while on duty and in full uniform, mostly late at night. Fischer’s attorney at the time, Richard Pinckard, questioned the credibility of many of the alleged victims and said many had felony convictions. Pinckard and defense attorney Chris Kowalski previously argued that the women had consented to letting Fischer hug them. “It doesn’t look good, but it’s not a crime,” the attorney told the judge. Goldstein ruled that enough evidence was produced during the hearing for Fischer to stand trial. The judge said the women were the victims of mental and psychological coercion. He said all of the alleged victims were down on their luck and fearful of reporting what happened to them. Goldstein said he didn’t believe the women consented to Fischer hugging them. “They couldn’t adequately fight him off,” the judge said.